You know that awesome, cliché action-movie sequence where the hero jumps out of a car right before it shoots off a cliff? I’m sure you know what I mean. I’ve always wanted to do that! Today was going to be an easy day. You know… day off from my main job at the market, do a little side-job yard work, get a little sunshine. I didn’t realize I’d be jumping off a riding lawnmower as it plunged downhill. On Wednesdays, I landscape for a really nice lady named Lois. She lives outside of Coeur d’Alene in the “fancy home overlooking the lake on a hill” district. Every summer she rents her house (or yard I should say) for weddings. She has a nice riding mow, and I genuinely love the job. It’s outside and beautiful and even fun. That said, every landscaper who works a riding mow will mention a turn that makes their teeth grind. My “turn,” happens to have a hill next to it that dramatically declines into wilderness. No problem. Today, the grass was wet. It’s funny how time seems to slow down in radical moments. Looking back, I felt like I could’ve prepped a tuna salad sandwich with the time I had before the fall, which was really only two or three seconds. I better Titanic off of this thing! I jumped and hit the ground, soon hearing the mower make a ‘crunch’ sound. I stood up, as slowly as I could muster, and turned my head towards the direction of the renegade-riding mower. God, I didn’t want to look. 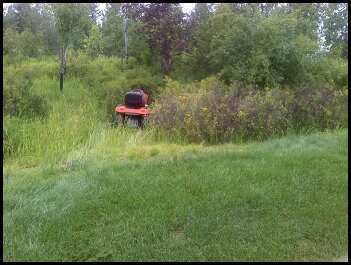 There, downhill, the mower rested in a safe net of bushes. In fact, it couldn’t have had a softer landing. Laughing, I ran down the hill and jumped on the dusty mower and started the engine. I threw the gear in reverse but it wouldn’t go. It tried, I tried, the wheels turned and all, but it wouldn’t go. After a good ten minutes of this back and forth gear shifting, manually lifting the mower, and pushing and pulling in ridiculous helplessness, I rested. I thought about calling some friends, but everyone I knew lived roughly twenty-hours away in California. Lois was gone for a few hours, the only good thing. The hill looks bigger in person okay? During the summer, Lois turns her guest room into a bed and breakfast. I thought the house was empty, but I forgot about the B&B guests! Suddenly, I heard a door open. “Hey! Hey!” I rushed up the hill to the guest’s door with my arms waving. Flustered and bewildered, the man stepped back and threw his fists into a fighting stance (protecting his wife). “Do you… I… well…” I was out of breathe and apparently lost my vocabulary on the fall. It wasn’t helping my case that the stranger thought me a lunatic. Thankfully, his eyes looked down and saw the green on my clothes and (eventually) the mower in the bushes. “Did you ride that down the hill?” He asked. “Well no, it roooollllled.” I made the gesture of a smooth downward drift with my hand. I must’ve looked insane. Crazy or not, this answered prayer of a man helped me pull, push, and lift the mower out of the bushes. It turned out this guy was a saint. My conscious got the best of me, and I did tell her. She took it great and actually laughed when I gave her the story. She felt bad for me, could you believe that? Watch out for wet grass? Don’t cut too close to the edge? Slingblade Lois….Kevin always used a slingblade in Cali. Did he tell you he was experienced with gas equipment Lois? Great story as always Kev! Ha ha, thanks Andy. Slingblade! Why did I forget my slingblade? Oh Deborah! You the man. THE MAN.